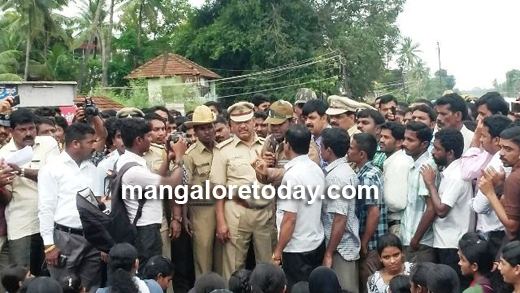 Kundapur, Jun 18, 2015 : The students with the support of local leaders held a strong protest in the streets of Byndoor on Thursday June 18, over the death of Akshata, a 17 year old girl from Byndoor. Akshatha was found dead near the temple bushes at Byndoor on June 17, evening. The police have confirmed that she was murdered while she was on her way to her house from college. 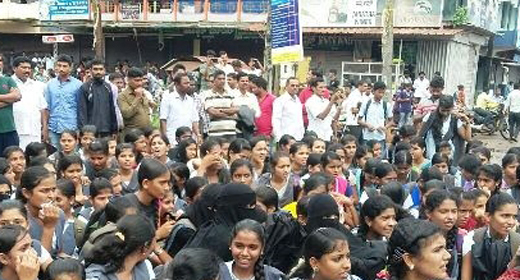 The public and local leaders and the students of Byndoor Junior college gathered at the Byndoor circle and blocked the road and shouted the slogans. All the shops in Byndoor were closed in order to support Akshata in the protest. The police arrived at the spot to control the situation. But when the protestors blocked the road and refused to leave, SP Annamalai arrived and tried to pacify the protesters. The protesters censured that the similar incident had occurred last year where Ratna Kotari was found dead, and the former SP Boralingaiah had assured of arresting the culprit but he did not succeed in arresting. The protester alleged that, the culprits will also manage to escape in this case. The protestors demanded speedy action against the culprits without the political affiliation. SP Annamalai promised that Udupi police will investigate the case and urged the protesters to give three days time. The protester warned the police to investigate within three days else they would go violent.